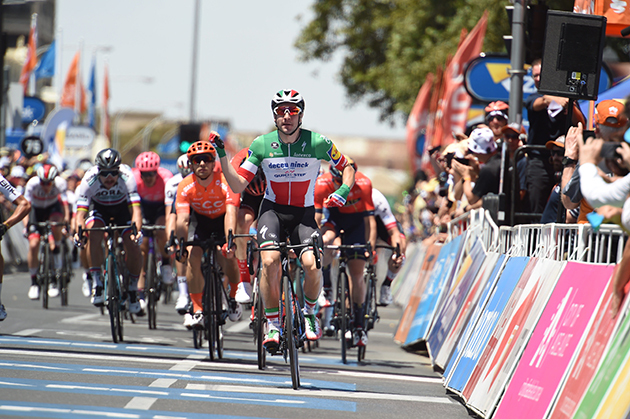 A headwind sprint has made for an intriguing start to the 2019 Santos Tour Down Under, with Deceuninck – Quick-Step’s Elia Viviani taking the line for Ziptrak Stage 1 and winning the honour of holding the Santos Ochre Leader’s jersey overnight. It’s the perfect start to the Italian National Champion’s season, having arrived on the first team flight into Adelaide and preparing with his Belgian with recons of the Adelaide hills from their first opportunity. The 29-year-old comfortably engaged the track power he honed at the Adelaide SuperDrome during the week to launch from the fourth row in the pack to reel in Sunweb’s man mountain Max Walscheid to comfortably seize the win. 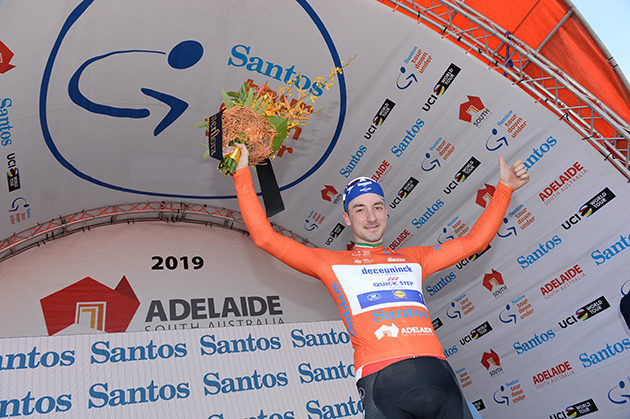 Walscheid – the 25-year-old German who has flown under the radar thanks to other high profile sprinters in Adelaide – finished second ahead of another Italian in the CCC Team, rider Jakub Mareczko. Phil Bauhaus (Bahrain Merida) was fourth while Ryan Gibbons (Dimension Data) was fifth across the line. Slovak triple world champion Peter Sagan (BORA-hansgrohe) was eighth, while Down Under Classic winner Caleb Ewan was down the order in 22nd across. 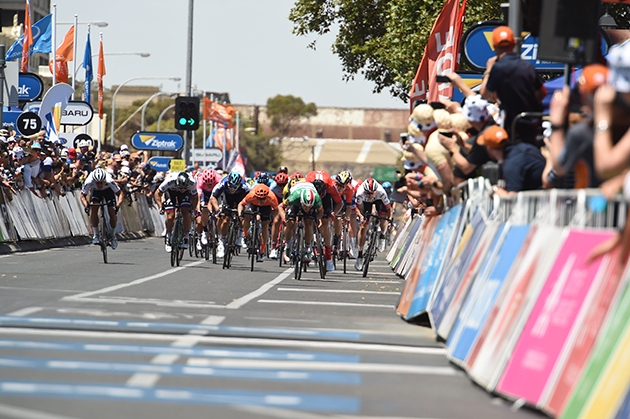 Despite a south-westerly wind forecast for Adelaide’s high-temperature day, the peloton was forced to battle a steady headwind coming into Port Adelaide. Powering to the line was no problem for the world’s fastest sprinters, but getting there was a battle of tactics. 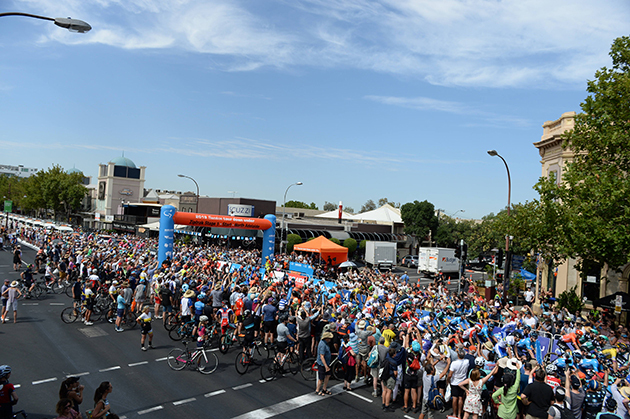 The peloton eased its pace with 20km to go as it made its way through the northern suburbs of Adelaide in anticipation of its western deviation to the Port. 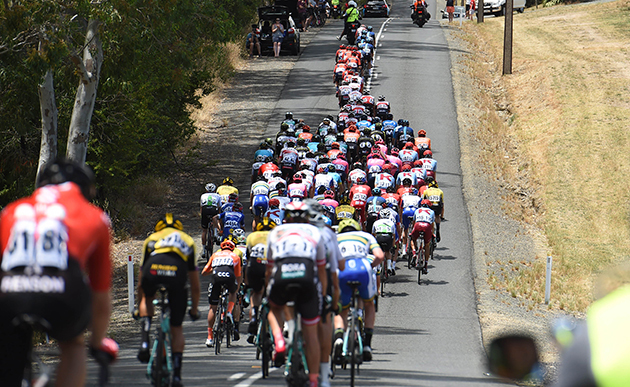 The pace kicked as the peloton closed within 10 kilometres of the finish through Mawson Lakes onto the long, unprotected Port River Expressway. Spreading across the full three width of the carriageway, teams began moving into formation for the finish. But with two final 90-degree turns within the final kilometre (a long drive to the finish), the bunch scrambled for organisation as the finish closed in. Jumbo Visma was in train early, but it was Walscheid who broke best heading to the line before Viviani swooped – not unlike his win in Victor Harbor last year – to claim the opening stage. 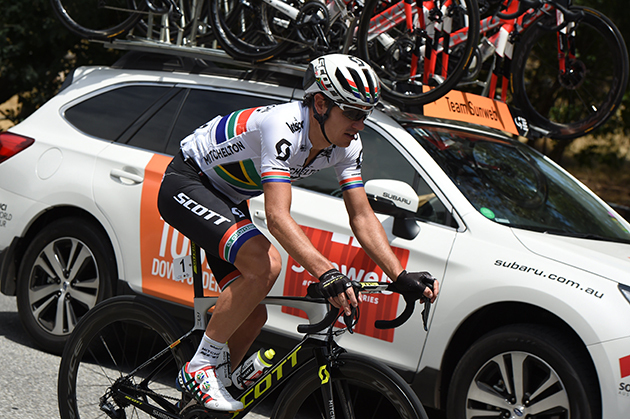 He will now wear the Santos Ochre jersey when the race re-starts in Norwood on Wednesday for Novatech Stage 2, while his Ziptrak® sprinter’s jersey will fall to the shoulders of Walscheid as next best-placed. The Santos Tour Down Under is one of the few UCI WorldTour races where the home country’s national representative team is given a start. Because of that, UniSA-Australia’s riders – all of whom are looking to impress for pro contracts – are usually featured in the early breakaway. 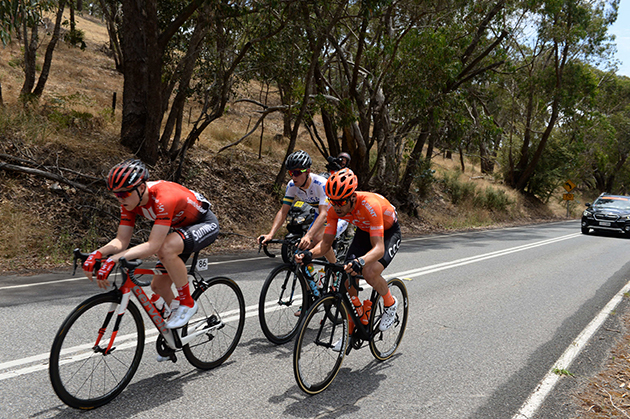 It was no different on Ziptrak Stage 1, with Jason Lea (UniSA-Australia) joining Artyom Zakharov (Astana), Paddy Bevin (CCC Team) and Michael Storer (Team Sunweb) in the early break. 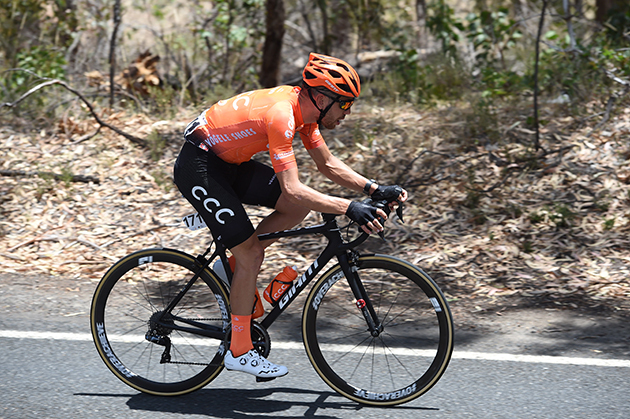 They eked out a maximum four-minute lead, which the peloton whittled down to just over two by the time they reached the foot of the Subaru King of the Mountain climb at Snake Gully. The 9% gradient was tough in plus-45-degree conditions, and so when Zakharov kicked with 100m to go, the response would be important to prevent him from claiming the Subaru polka dot jersey in Port Adelaide. Only one rider – Lea – answered the call, and successfully took the inside line up the final bend to the Subaru checkpoint to claim maximum points and the honour of the polkadots on Stage 2. 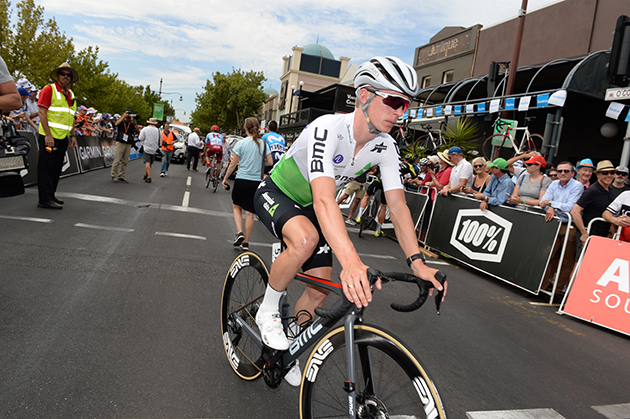 Zakharov bailed out of the breakaway after failing to claim the Subaru KOM checkpoint, and left it to the Trans-Tasman alliance of Aussies Lea and Storer, and Kiwi Bevin, to chalk up the Ziptrak sprints in Inglewood. Bevin and Storer split the winnings between them on the two sprint marks, before pushing out along the crest of Hermitage with Lea in tow. 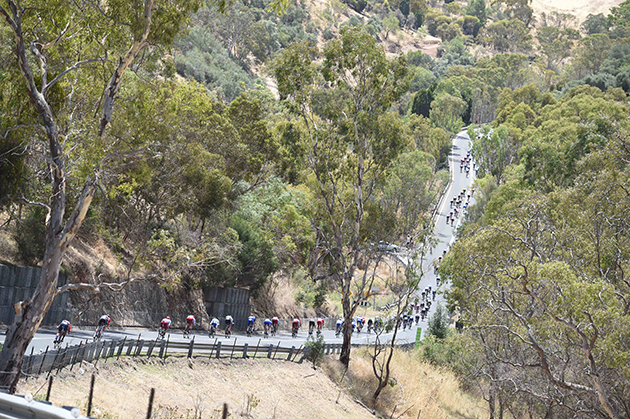 The breakaway didn’t last much longer than its foray through the technical descent back to Snake Gully – caught just over 40km from the finish. 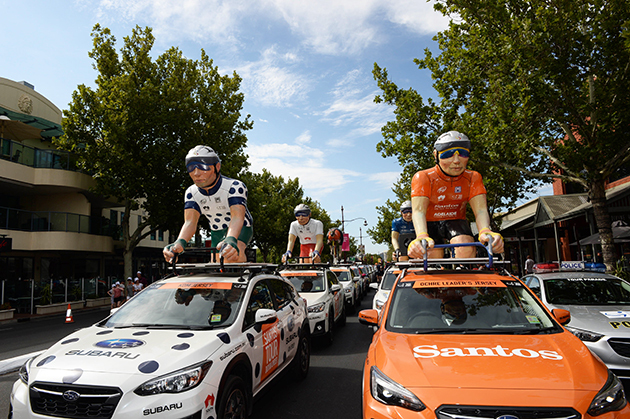 Santos Tour Down Under race organisers along with team and rider representatives have made the decision to modify the race route for Ziptrak Stage 1 tomorrow, Tuesday 15 January 2019. Based on the severe conditions forecast of strong winds, the 3.4 km finishing circuit will be removed. Race Director, Mike Turtur confirmed the peloton will now complete Ziptrak Stage 1 on the first approach to the line, with no final lap as previously planned. “The reason for this decision is the collective opinion of all representatives taking into consideration that the extreme weather conditions may result in a major peloton break-up which would be problematic on the finishing circuit,” said Race Director Mike Turtur. 2 WALSCHEID Max Team Sunweb s.t. 3 MARECZKO Jakub CCC Team s.t. 4 BAUHAUS Phil Bahrain-Merida s.t. 6 PHILIPSEN Jasper UAE-Team Emirates s.t. 7 HALVORSEN Kristoffer Sky s.t. 8 SAGAN Peter Bora-hansgrohe s.t. 9 VAN POPPEL Danny Jumbo-Visma s.t. 10 HOELGAARD Daniel Groupama-FDJ s.t. 11 IMPEY Daryl Mitchelton-Scott s.t. 12 BALLERINI Davide Astana s.t. 13 MCLAY Daniel EF Education First s.t. 14 REIJNEN Kiel Trek-Segafredo s.t. 15 STRAKHOV Dmitry Katusha-Alpecin s.t. 16 COSNEFROY Benoît Ag2r-La Mondiale s.t. 18 ULISSI Diego UAE-Team Emirates s.t. 19 POGAČAR Tadej UAE-Team Emirates s.t. 20 SÜTTERLIN Jasha Movistar s.t. 22 HAMILTON Chris Team Sunweb s.t. 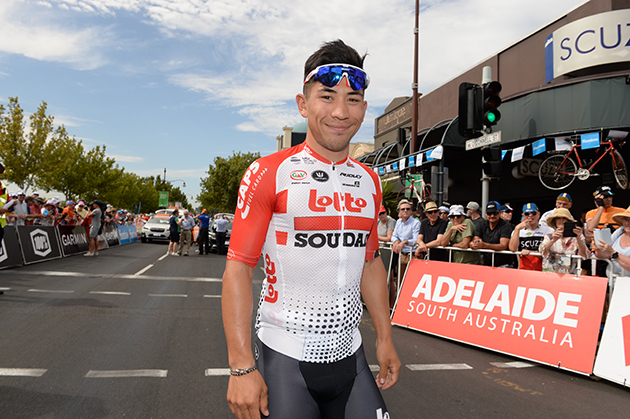 23 EWAN Caleb Lotto-Soudal s.t. 24 BEVIN Patrick CCC Team s.t. 25 MAS Lluís Movistar s.t. 26 POELS Wout Sky s.t. 27 GUERREIRO Ruben Katusha-Alpecin s.t. 28 BENNETT George Jumbo-Visma s.t. 29 SÁNCHEZ Luis León Astana s.t. 30 VAN DER PLOEG Neil UniSA-Australia s.t. 31 HALLER Marco Katusha-Alpecin s.t. 32 LATOUR Pierre Ag2r-La Mondiale s.t. 33 SAJNOK Szymon CCC Team s.t. 34 MEYER Cameron Mitchelton-Scott s.t. 35 SCOTSON Miles Groupama-FDJ s.t. 36 HAMILTON Lucas Mitchelton-Scott s.t. 37 WOODS Michael EF Education First s.t. 38 DE KORT Koen Trek-Segafredo s.t. 39 DLAMINI Nic Dimension Data s.t. 40 DEBUSSCHERE Jens Katusha-Alpecin s.t. 41 LUDVIGSSON Tobias Groupama-FDJ s.t. 42 DOULL Owain Sky s.t. 43 VENTOSO Francisco José CCC Team s.t. 44 EDMONDSON Alex Mitchelton-Scott s.t. 45 PETERS Nans Ag2r-La Mondiale s.t. 47 HEPBURN Michael Mitchelton-Scott s.t. 48 VAN BAARLE Dylan Sky s.t. 49 HARPER Chris UniSA-Australia s.t. 50 SLAGTER Tom-Jelte Dimension Data s.t. 51 GESINK Robert Jumbo-Visma s.t. 52 DEVENYNS Dries Deceuninck-Quick Step s.t. 53 MCCARTHY Jay Bora-hansgrohe s.t. 54 KUZNETSOV Vyacheslav Katusha-Alpecin s.t. 55 O'CONNOR Ben Dimension Data s.t. 56 HAUSSLER Heinrich Bahrain-Merida s.t. 57 PRADES Eduard Movistar s.t. 58 LINDEMAN Bert-Jan Jumbo-Visma s.t. 59 PORTE Richie Trek-Segafredo s.t. 60 FERNÁNDEZ Rubén Movistar s.t. 61 MÜHLBERGER Gregor Bora-hansgrohe s.t. 62 OWSIAN Łukasz CCC Team s.t. 63 MØRKØV Michael Deceuninck-Quick Step s.t. 64 BAGDONAS Gediminas Ag2r-La Mondiale s.t. 65 CASTRILLO Jaime Movistar s.t. 66 KLUGE Roger Lotto-Soudal s.t. 67 ROWE Luke Sky s.t. 68 CARRETERO Héctor Movistar s.t. 69 OLIVEIRA Ivo UAE-Team Emirates s.t. 70 HONORÉ Mikkel Frølich Deceuninck-Quick Step s.t. 71 SABATINI Fabio Deceuninck-Quick Step s.t. 72 DOWSETT Alex Katusha-Alpecin s.t. 73 HINDLEY Jai Team Sunweb s.t. 74 ARASHIRO Yukiya Bahrain-Merida s.t. 75 ROSSKOPF Joey CCC Team s.t. 76 VALLS Rafael Movistar s.t. 77 BAK Lars Ytting Dimension Data s.t. 78 SUNDERLAND Dylan UniSA-Australia s.t. 79 CHEVRIER Clément Ag2r-La Mondiale s.t. 80 PANTANO Jarlinson Trek-Segafredo s.t. 81 LEA Jason UniSA-Australia s.t. 82 MORABITO Steve Groupama-FDJ s.t. 83 DE LA PARTE Víctor CCC Team s.t. 84 POZZOVIVO Domenico Bahrain-Merida s.t. 85 STETINA Peter Trek-Segafredo s.t. 86 LADAGNOUS Matthieu Groupama-FDJ s.t. 87 CLARKE Will Trek-Segafredo s.t. 89 VALGREN Michael Dimension Data s.t. 90 LEEZER Tom Jumbo-Visma s.t. 91 KNEES Christian Sky s.t. 92 FRANKINY Kilian Groupama-FDJ s.t. 94 DENNIS Rohan Bahrain-Merida s.t. 95 DURBRIDGE Luke Mitchelton-Scott s.t. 96 DUPONT Hubert Ag2r-La Mondiale s.t. 97 WHELAN James EF Education First s.t. 98 ELISSONDE Kenny Sky s.t. 99 STORER Michael Team Sunweb s.t. 100 CAVAGNA Rémi Deceuninck-Quick Step s.t. 101 HAGEN Carl Fredrik Lotto-Soudal s.t. 102 DENZ Nico Ag2r-La Mondiale s.t. 103 FOMINYKH Daniil Astana s.t. 104 VINCENT Léo Groupama-FDJ s.t. 105 BYSTRØM Sven Erik UAE-Team Emirates s.t. 106 GIDICH Yevgeniy Astana s.t. 107 KNOX James Deceuninck-Quick Step s.t. 108 PERNSTEINER Hermann Bahrain-Merida s.t. 109 DAVIES Scott Dimension Data s.t. 110 HAYMAN Mathew Mitchelton-Scott s.t. 111 SUTHERLAND Rory UAE-Team Emirates s.t. 112 FRÖHLINGER Johannes Team Sunweb s.t. 113 POTTER Michael UniSA-Australia s.t. 114 DE GENDT Thomas Lotto-Soudal s.t. 115 HANSEN Adam Lotto-Soudal s.t. 119 BLYTHE Adam Lotto-Soudal s.t. 121 BOL Cees Team Sunweb s.t. 123 BETTIOL Alberto EF Education First s.t. 125 OSS Daniel Bora-hansgrohe s.t. 126 BODNAR Maciej Bora-hansgrohe s.t. 129 KANTER Max Team Sunweb s.t. 4 STORER Michael Team Sunweb s.t. 9 PHILIPSEN Jasper UAE-Team Emirates s.t. 10 HALVORSEN Kristoffer Sky s.t. 11 SAGAN Peter Bora-hansgrohe s.t. 12 VAN POPPEL Danny Jumbo-Visma s.t. 13 HOELGAARD Daniel Groupama-FDJ s.t. 14 IMPEY Daryl Mitchelton-Scott s.t. 15 BALLERINI Davide Astana s.t. 16 MCLAY Daniel EF Education First s.t. 17 REIJNEN Kiel Trek-Segafredo s.t. 18 STRAKHOV Dmitry Katusha-Alpecin s.t. 19 COSNEFROY Benoît Ag2r-La Mondiale s.t. 21 ULISSI Diego UAE-Team Emirates s.t. 22 POGAČAR Tadej UAE-Team Emirates s.t. 23 SÜTTERLIN Jasha Movistar s.t. 24 POLANC Jan UAE-Team Emirates s.t. 25 HAMILTON Chris Team Sunweb s.t. 26 EWAN Caleb Lotto-Soudal s.t. 27 MAS Lluís Movistar s.t. 28 POELS Wout Sky s.t. 29 GUERREIRO Ruben Katusha-Alpecin s.t. 30 BENNETT George Jumbo-Visma s.t. 31 SÁNCHEZ Luis León Astana s.t. 32 VAN DER PLOEG Neil UniSA-Australia s.t. 33 HALLER Marco Katusha-Alpecin s.t. 34 LATOUR Pierre Ag2r-La Mondiale s.t. 35 SAJNOK Szymon CCC Team s.t. 36 MEYER Cameron Mitchelton-Scott s.t. 37 SCOTSON Miles Groupama-FDJ s.t. 38 HAMILTON Lucas Mitchelton-Scott s.t. 39 WOODS Michael EF Education First s.t. 40 DE KORT Koen Trek-Segafredo s.t. 41 DLAMINI Nic Dimension Data s.t. 42 DEBUSSCHERE Jens Katusha-Alpecin s.t. 43 LUDVIGSSON Tobias Groupama-FDJ s.t. 44 DOULL Owain Sky s.t. 45 VENTOSO Francisco José CCC Team s.t. 46 EDMONDSON Alex Mitchelton-Scott s.t. 47 PETERS Nans Ag2r-La Mondiale s.t. 48 DE VREESE Laurens Astana s.t. 49 HEPBURN Michael Mitchelton-Scott s.t. 50 VAN BAARLE Dylan Sky s.t. 51 HARPER Chris UniSA-Australia s.t. 52 SLAGTER Tom-Jelte Dimension Data s.t. 53 GESINK Robert Jumbo-Visma s.t. 54 DEVENYNS Dries Deceuninck-Quick Step s.t. 55 MCCARTHY Jay Bora-hansgrohe s.t. 56 KUZNETSOV Vyacheslav Katusha-Alpecin s.t. 57 O'CONNOR Ben Dimension Data s.t. 58 HAUSSLER Heinrich Bahrain-Merida s.t. 59 PRADES Eduard Movistar s.t. 60 LINDEMAN Bert-Jan Jumbo-Visma s.t. 61 PORTE Richie Trek-Segafredo s.t. 62 FERNÁNDEZ Rubén Movistar s.t. 63 MÜHLBERGER Gregor Bora-hansgrohe s.t. 64 OWSIAN Łukasz CCC Team s.t. 65 MØRKØV Michael Deceuninck-Quick Step s.t. 66 BAGDONAS Gediminas Ag2r-La Mondiale s.t. 67 CASTRILLO Jaime Movistar s.t. 68 KLUGE Roger Lotto-Soudal s.t. 69 ROWE Luke Sky s.t. 70 CARRETERO Héctor Movistar s.t. 71 OLIVEIRA Ivo UAE-Team Emirates s.t. 72 HONORÉ Mikkel Frølich Deceuninck-Quick Step s.t. 73 SABATINI Fabio Deceuninck-Quick Step s.t. 74 DOWSETT Alex Katusha-Alpecin s.t. 75 HINDLEY Jai Team Sunweb s.t. 76 ARASHIRO Yukiya Bahrain-Merida s.t. 77 ROSSKOPF Joey CCC Team s.t. 78 VALLS Rafael Movistar s.t. 79 BAK Lars Ytting Dimension Data s.t. 80 SUNDERLAND Dylan UniSA-Australia s.t. 81 CHEVRIER Clément Ag2r-La Mondiale s.t. 82 PANTANO Jarlinson Trek-Segafredo s.t. 83 MORABITO Steve Groupama-FDJ s.t. 84 DE LA PARTE Víctor CCC Team s.t. 85 POZZOVIVO Domenico Bahrain-Merida s.t. 87 LADAGNOUS Matthieu Groupama-FDJ s.t. 88 CLARKE Will Trek-Segafredo s.t. 90 VALGREN Michael Dimension Data s.t. 91 LEEZER Tom Jumbo-Visma s.t. 92 KNEES Christian Sky s.t. 93 FRANKINY Kilian Groupama-FDJ s.t. 94 TOOVEY Ayden UniSA-Australia s.t. 95 DENNIS Rohan Bahrain-Merida s.t. 96 DURBRIDGE Luke Mitchelton-Scott s.t. 97 DUPONT Hubert Ag2r-La Mondiale s.t. 98 WHELAN James EF Education First s.t. 99 ELISSONDE Kenny Sky s.t. Down Under Classic winner Caleb Ewan before the race start. The caravan is lined up and ready to go. The peloton racing under the hot sun. 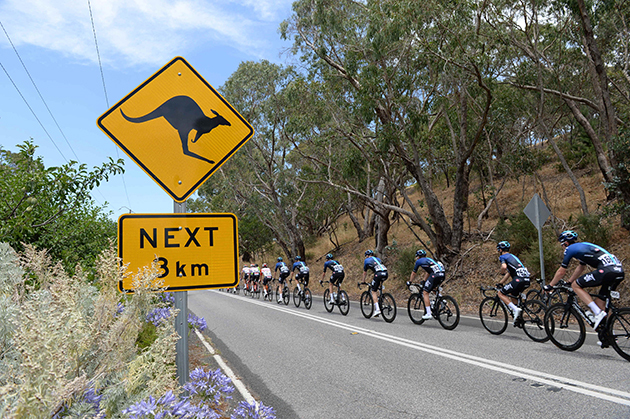 Our obligatory Tour Down Under kangaroo crossing sign picture. Elia Viviani is the day's fastest rider. Viviani will start stage two in the GC leader's jersey.